Diffusion MRI is a magnetic resonance imaging (MRI) method that produces in vivo images of biological tissues weighted with the local microstructural characteristics of water diffusion, providing an effective means of visualizing functional connectivities in the nervous system. This book is the first comprehensive reference promoting the understanding of this rapidly evolving and powerful technology and providing the essential handbook for designing, analyzing or interpreting diffusion MR experiments. 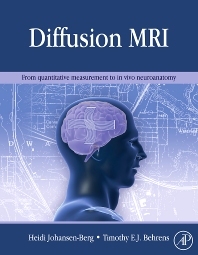 The book presents diffusion imaging in the context of well-established, classical experimental techniques, so that readers will be able to assess the scope and limitations of the new imaging technology with respect to techniques available previously. All chapters are written by leading international experts and cover methodology, validation of the imaging technology, application of diffusion imaging to the study of variation and development of normal brain anatomy, and disruption to the white matter in neurological disease or psychiatric disorder. Neuroscientists interested in the study of connections in the brain, brain imaging, within Cognitive Neuroscience, Neuroscience, Radiology, Medical Physics and adjacent areas. II Multiple fibers: what’s all the fuss about? IV Diffusion Tensor Imaging – A Tool for White Matter Microstructural Mapping? III FUTURE DIRECTIONS, WHAT ARE WE MISSING, AND HOW CAN WE FILL IN THE GAPS? I What is the Connectome?